Best SECURE storage solution to share PHOTOS &	VIDEOS. Get unlimited storage space to save and share unlimited number of photos and videos. No renewals. No hidden costs. Your memories are our number one priority. It's our mission to help you preserve, share and enjoy them all in one place. Bringing people together through photos and videos from around the world. We're here to help you make the most of life's special moments. Your photos & videos represent moments, memories and feelings that cannot be put into words. Photo & Video Sharing offers a wide selection of high quality private sharing. Share videos and photos with friends and family. Create online photo and video albums. Your friends and family with whom you shared your albums can view your albums for FREE. But can't have complete access to your photo & video albums due to high quality private sharing. The best secure cloud storage solution to share photos & videos. Protect your personal content. Enjoy complete control over who sees your media albums and what albums they can see and how many times they visited. Upload photos & videos from your device library to your personal Photo & Video Sharing account, SAVING storage space in your device. Personalized guest Invitations with unique guest passwords separately for each guest makes it easy to invite family and friends to view your video and photo albums. Post high-definition photos or videos to your account, effortlessly. Fast and easy sharing for your digital photos and home movies via secured private cloud. Your videos can be viewed full screen. Members and their friends and family can go to one place to find albums that may date back months or even years. Easily password protect your photo and video albums. Unlimited Cloud Storage to store unlimited number of photos and high quality digital videos. Keep photos & videos of friends and family safe and secure. Uploading is easy, and access is just a click away. Photo & Video Sharing technology ensures that your friends and family will have a great experience viewing your photos & videos. 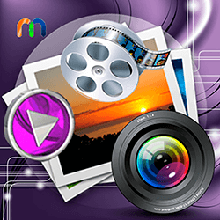 Photo & Video Sharing enables you to share your photos & digital home movies online with family and friends instantly. With Photo & Video Sharing, there are no quality or bit-rate limits, or automatic conversion to any other video format. Photo & Video Sharing for all ages. STORE, SHARE & ENJOY all at one place with unlimited storage space. Please donate to keep this project Photo & Video sharing alive like how others donated to keep it alive for you. Donation we receive would be spent for this project maintainance. Feature Best SECURE storage solution to share PHOTOS &	VIDEOS. •STORE, SHARE & ENJOY all at one place. • No renewals. No hidden costs. • Store, share & enjoy all your photos & videos securely at one place. This product is a great turnkey solution to keep a cloud copy of your photos and videos from any device. My photos and videos can be accessed from any device. Save space in your device and still have media in your device. Magic. Now I need not worry my device would be out of space. Love it. This photo and video sharing would be big hit. Was able to upload pics vids from several devices easily. Unlimited storage space… Keep this kind of service up and going and you will get so many new customers you will not know what to do with them all! This has solved a major issue of storage space for backups. You will be amazed at how much faster this cloud works! I moved my photos and videos from all my devices to this cloud. Now I can access them from anywhere anytime. Having tried a couple of cloud services I find several major issues with them. But this is the best. This product saved my life! I recently had to purchase a new device and thought I'd lost all my photos and videos. Thanx to the photo and video sharing. I was able to save all of them in unlimited private cloud space provided by this service and share them with my friends & family on my any device. Love this. I don't have to worry about losing photos when I upgrade devies again. This product worked just like it was advertised that it would. I am still learning everything it will do. It is nice to look at pictures in photo and video sharing. Great, this product gives me all the space I need to store my photos and videos. I never have to worry about loosing my pictures & videos now. Also I do a lot of picture sharing on twītter and via emails and this service has really simplified that for me with easy sharing via single invitation to view multiple albums. Videos automatically copy from camera to private cloud storage. Protect your photos & videos with unlimited storage, automatic backup & a private cloud. Your photos and videos are 100% private and available even if you lose or damage your device. I like the idea of the bigger views when the product 1st opens giving you the opportunity to choose selected albums to selected friends and also edit invitation history you're looking for! Great service so far, unlimited photo and video storage ;-). This is awesome!!! I have all of my pictures videos from my computer, phone and tablet saved here. They are organized by year and month, so finding specific pictures videos is very easy. The automatic video upload is very helpful. It couldn't be any easier to upload my photos and videos from my devices to the cloud drive and have then instantly available to show. It lets me view my photos and videos across all my devices. I am enjoying this feature very helpful. Thank you so much makes it easier. This saves up space on my pc, camera, phones and tablets. Excellent & Extremely Helpful. I was tired of sending photos and videos my email. This made it super easy to share with friends and family. Highly satisfied. What more could I ask for? I am not a tech savvy person so I was thrilled when I was able to 1) Understand and follow the instructions and 2) Successfully transfer, organize, share photos and videos from my device to private cloud. This product really resolved my issue of storing and sharing my photos and videos with unlimited private cloud storage space and wonderful way to share them with my friends and family. Love sharing part of my life with family &friends. it's awesome to be able to transfer my many photos, videos and free up some room. Very easy to use. Uploads pics and videos fast. I like having all my photos and videos saved in one place and that I can organize by album. Love it. Have already recommended to a friend. This product saved my life! I recently had to purchase a new phone and thought I'd lost all my photos. Thanx to the cloud drive product I was able to retrieve all of them on any of my tech devices. Great, for me is just what I needed, Saves me lots of space on my device and wonderful layout to share and view pictures and videos. It is awesome. What's not to like? I'm an enthusiast photographer, i take pictures of everything i think it's pretty, portrait, landscape, wild life. I have bunch of pictures. With this hosting service, i can store them all securely. Thanks. This product gives me the feeling of confidence, and trust in storing my keepsake digital items, I'm thrilled to have a safe place to keep them, the product is hassle free, and convenient. Take my photos videos and see them on the cloud from my devices. So easy. fun, rewarding, exciting for me. Highly recommend. I’ve been looking this kind of product for so long ago..and thanks to this photo and video sharing, I found it already. The best product to securely hide, save and share your personal photos n videos. Love it. I like that layout when browsing but also like the view for creating folders so I can organize by whatever category I want. Easy and fun!! Glad to have this feature! This is a great idea and happy to be able to have it! I love having them with a tap my finger. I use my pictures for display at work, nice to have a no fail way to get them. Easy to use. Very helpful and you get to what you need immediately even if you're not a hundred percent sure it will help you I love it. I have been pleased with "Smile" so far. Always have way to many pictures and videos on my phone. Cloud does a great job of storing and preserving everything. I was very thankful that I was able to save my pictures… and videos. I am enjoying this service. Very helpful. Thank you so much makes my life easier. Recommended it to my friends. I've been waiting for something like this. It works great! Thank you. Doing things "in the cloud" is very new concept to me. With it's easy set up this was a great intro to it. I love it! Easy to use and user friendly functions Works great and no issues what's over! --------Rocks!!!!! !♡♡♡♡♡♡♡♡♡ Thank You. I AM VERY NEW TO CLOUD. BUT I AM SO FAR EXTREMELY PLEASED WITH IT. CANNOT WAIT TO SEE ALL IT HAS TO OFFER. I’M EXCITED TO HAVE IT. Love it.Friendly interface and best of all, unlimited photo & video storage for private cloud members. DigiGalaxy.Net is just reliable in my mind due to my experience with orders from Digi Galaxy. So I uploaded some pics from my android phone, then uploaded pics and videos from my laptop. It works like a charm and is not at all difficult to work with. I especially like the fact that with my phone, I can view my photos anywhere I go. I also like how easy it is to manage and arrange photos and videos in albums.For this kind of service, I can't mention any cons. I found it very useful because it is fast in bringing up the photos and videos and easy to share securely. Using the cloud for pictures and video storage is a wonderful idea. Unlimited storage is great gift from Digi Galaxy. It makes it pretty much effortless to copy pictures to the cloud drive and then retrieve and view them anywhere. You can also upload pics taken on your phone. Automatically, if so desired. It's easy as pie! This is a great service. So far its doing what i need it to. Store all my pictures and videos! And does it automatically. So no cons yet. Saves space on tablet, phone and other devices. Also wonderful way to share media with friends and family. The reason I gave this a 5star is because it was GREAT. What I liked about this product? It does what it suppose to! I was excited when I was introduced to another cloud storage. But quickly a disappointment...charging high monthly charges..didn't realize that photos were not backed up to that cloud...until my phone was damaged and was disappointed when I found that precious memories lost because I had reached limit and to continue to use would have to pay a monthly fee. ...it was sad ...I was a beginner smartphone user but thanks to photo and video sharing. I feel like a pro...great benefits all around... Best Ever .... Photo and Video sharing!!!! ?????? If you take a lot of pictures this is perfect for you. Easy to manage photos with albums and has an option to automatically upload pics as you take them. If you need space on your phone just upload all your pics to this cloud then delete them from your device. Easier to use than flicker and faster in my samsung g2. Easy way to store and access all my photos on the go! The cloud works great, no issues. It is really nice not having to keep all my pictures on my phone. That took up so much memory. I really like the layout of the cloud and the website. I mainly use it to back-up my cell phone camera pictures. I do a lot of inspections so I take many pictures of different jobs and it is nice to have them automatically saved. It is also nice to be able to review the photos from the cloud and be able to share only what I need. Simply Great. ABSOLUTELY AMAZED & SATISFIED in all regards. I did not know what a "Cloud drive" really was and so did not care much either way. Now that I realize how easy it is to upload and access my photos etc I am blown away. I love it! Really handy. I like to take photos, of family, friends, animals and nature, places I go and interesting things that I see. Mostly since my kids were born I take lots of photos of them. They're so cute and getting bigger every day. I could not figure out any way to move my pictures off of my phone in a convenient way. This photo and video sharing cloud let me do that. It was very quick and I was more excited than I thought to be able to view those pics on my tablet. Works well for me. Very easy to use. It allows me to retrieve photos on a fluid basis without scouring the web for what seems to be an appreciable amount of time. I can easily organize photo and videos into different albums. Uploading and accessing media is really easy and super fast. I should accept it is really wonderful service. Anywhere, Anytime. You can't beat the ease of backing up and sharing photos. I give this 5 stars because it has the easiest access to my photos compared to any other Cloud storage I've used. If you are looking for photo and video cloud service then you're crazy not to utilize this safe, secure service. It rocks! Simply Great. We love all your products and services.This adds to the list!! I adore the Cloud Storage. Seamlessly uploaded more than 5,000 photos from various devices!!! Now i can cancel my expensive cloud storage. I'm so happy and thank you Digi Galaxy for keeping it awesome!!! Unlimited cloud storage for Life, and we'll keep telling everyone we know!!! Works Fabulous! Love it. Very useful and also saved me some bucks. I know little or nothing about backing up photos, or much of anything, come to think it; this resolved my issue. Very easy to follow instructions and wonderful interface. It lets me view and share my photos and videos across all my devices. No complains. I am really enjoying this service. Great, for me is just what I needed, Saves me lots of work saving in a pen drive to take my pictures and files home. A 'Just Perfect' application for uploading and preserving and sharing photos, videos with fast accessibility from multiple devices (your computer, your iPhone, iPad, or Kindle). Can't complain. Just perfect and Oh So Reliable! So nice to have free unlimited cloud storage. No more telling me I need to buy more storage. I have it all for free. I love this product! Cloud comes in handy when my phone gets too full, even with my SD card I run out of space because I take so many pictures. It was a really useful. I am able to save several pictures with high quality, I recommend it to everyone. Really easy and super fast. It is awesome to be able to get to photos and videos on the Cloud! This allows me to at see and also show them to others by easy sharing. This is really nice to have. It works brilliant. I was very thankful that I was able to save my pictures... and also like all its features. Perfect and definitely a useful feature. I am enjoying all features in this photo and video sharing. Very helpful. Thank you so much makes it easier. Uploading was a breeze, I easily chose which album I wanted to upload and the uploader tool did the rest!!! I am grateful to get free unlimited cloud storage and enjoying all features. Great to consolidate pics and videos from multiple devices. Easy way to store and access all my photos and videos on the go! It is really nice not having to keep all my media on my phone. That took up so much memory. I really like the layout and the website. I like having access to everything via this site. If anything happens to my phone, computer or any storage device I will still have everything safely stored on the cloud drive. I would gladly recommend to anyone who want to see their pictures and videos on multiple devices. Great resource to protect photos and videos. I'm giving five stars because 1) It's unlimited storage that's free and 2) You can organize your photos & videos into albums. 3) Sending invitations with only selected albums to share with friends and family. 4) Invitation history to view guest visits and easily add or remove guest albums. 5) Powerful security settings. Absolutely love this service. Great way to share photos & videos. I give this 5 stars because it has the easiest access to my photos and videos compared to any other Cloud storage I've used. Cloud drive is awesome.